The first German-French Workshop in Metz 1995 had at least 20 German participants - in Aachen there were 31 French delegates and only 18 Germans! We can see what they're thinking from the worried expressions in the photo: "Where is the German industry?" The workshop was up-to date with a topical program and famous speakers, an excellent venue for Aachen. But neither the Germans automation testing users nor the advanced service companies visitors were represented. Eastern holidays? To much DGZfP events? Cut budgets? No, the most likely reason is the expectation that the necessary testing equipment can be purchased at the time it's needed. If that is true we can rename the Economic Ministry in Trade to just plain "Ministry" and eliminate the Research part from the Education and Research Ministry. Save the Finance Ministry some money. Is The Aachen Workshop a true reflection of German NDT contribution to the Euro? This frequently bilateral event is organized by the national NDT societies DGZfP and CONFREND. This time 16 lectures were presented on 17-18 March in Aachen. The organizers pointed out the importance of this event. Friendship between two major European countries in a time of strong market changes is promoted. Progress is made toward establishment of a strong position in the European framework of building a ECNDT in Brüssel. The two workshop topics 'automation' and 'modeling' have a high priority today . Modeling developments increased worldwide and reached a stage where complex testing tasks can be simulated. It is also a tool for manual testing with assistance for method selection, optimizing parameters, validation and evaluation of test results. Today, most programs can be run on a standard PC. Lectures 2, 3, 4, 6, focused on modeling for ultrasonic testing. Automation is important for performing economical and reliable NDT. In regard to ultrasonic testing the lectures 10, 11,12, 13, 14 focused on that. Why are there so few participants? We might ask if it's such good idea to hold a workshop in ONLY German and French. It's true, simultaneous translation for just a handful of people would require a lot of effort, but looking at the participants' profiles it doesn't seem like there would be any problem with using English as the workshop language. Another drawback to the present system is that the lectures are printed in the author's language, so it's going to be difficult to browse the papers later, anyway. So why not to print all lectures in English? The orals could be given in English and if it's really necessary, a simultaneous French translation. We offer the following partially translated information to let English speakers access the workshop material. Also we thank Mr. Desruelles from Framatome  for his contribution of a full text English paper. The program organizer Hermann Wuestenberg and Robert Levy were very satisfied in their resumes: A lot of information on the progress of NDT presented as a basis for its industrial usage. 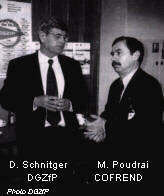 The third German-French workshop is planned for September '99 in Lyon. Again, we are hoping to combine two themes - maybe characterization and modeling. .